Welcome to Newport County RIGenWeb, a part of the Rhode Island USGenWeb Genealogy and History Project, which is under the umbrella of the USGenWeb Project. Although Newport County is a small county in the smallest state, it is a treasure trove of original documents which date back to the 1600's. Consequently, researchers from all over the states like to come here to study early American history and explore their family genealogy. Fortunate are they who do come for Newport County has preserved much of its history and architecture. Visitors can stroll along streets which are as they were when George Washington addressed the troops during the Revolution and when their ancestors lived here. Newport County is very beautiful. Its outstanding coastline is very accessible because colonial laws preventing restriction of coastal access are still intact. Newport's 10-mile Ocean Drive and Cliff Walk are not to be missed. All communities have fine beaches. Middletown's Sachuest Beach is a jewel. 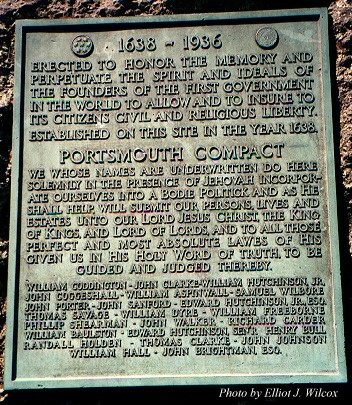 Indeed Rhode Island loves and preserves its history. You will find early America here. It is subtle and quiet and everywhere for those who take some time to discover it. On scenic roads of Portsmouth, Tiverton and Little Compton you will pass farms enclosed by stone walls built by our colonial ancestors. Near the house, there may be a small cemetery containing the graves of the original inhabitants. En route to touristic Newport, on the small island of Jamestown, you will find more than a dozen historic sites, including an 18th century farm still owned by the original family. Coming soon are more photographs of Aquidneck Island gravestones and images of original Portsmouth documents. USGenWeb Project NOTE: The USGenWeb Project is NOT affiliated with USGenWeb, Inc.
Because Rhode Island cemeteries were most often on private land, there are hundreds of small cemeteries. Newport County, Rhode Island, Mailing List https://sites.rootsweb.com/~rinewpor/mailist.html NOTE: Newport County RIGenWeb Queries have been discontinued. Rhode Island Reading Room. Genealogy and History Articles. Audely Clarke's Voyage, A Correspondent's Recollections of That Memorable Trip to California in '49 transcribed from Newport Mercury, May 20, 1882; includes list of those who took part in the voyage plus many other interesting news articles. NOTE: These documents are made available free to the public for non-commercial purposes by the Newport County, Rhode Island, USGenWeb Project. Please read restrictions. 1670 Grand Deed of the area that became Tiverton signed by Josiah Winslow Esq. Governor of the Colony of New Plymouth, Major William Bradford Treasurer. Thanks for visiting the Newport County, RIGenWeb. Click on any county, including Connecticut and Massachusetts, to go to a USGenWeb County web site.